So we were studying this amino acid called cysteine. Specifically we were studying it's effect on melanin genesis. 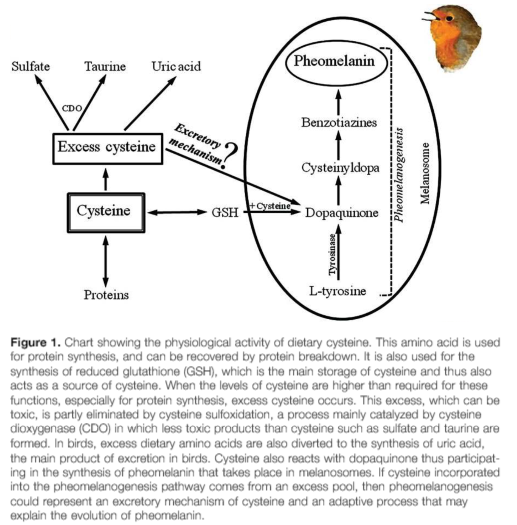 Our teacher told us how excess of cysteine affects the melanin synthesis by generating more pheomelanin. Low amount of cysteine promotes formation of eumelanin. He told us that if the concentration of cysteine is increased in cells then the above reaction starts producing pheomelanin in brown/black skinned people. I searched it on net and it seems to be true. The question is that if someone who has fair skin (produces more pheomelanin) is forced to live in low cysteine condition, then what happens? Eumelanin production should increase. His complexion must change. But it doesn't occur anywhere. Fair skinned people affected by malnutrition remain fairskinned. How is this possible? The pheomelanin production must stop since they aren't getting enough cysteine. Then how...? He also told us that onions contain large amount of cysteine yet it can't be used since it is destroyed by stomach acids. The first steps for both melanin forms are the oxidation of the amino acid Tyrosine to DOPA (L-3,4-Dihydroxyphenylalanine) and the to DOPA quinone by the enzyme Tyrosinase (abbreviated Tyr). In the following step the branches divert, if there is enough cysteine present in the cells, then Cysteinyl-DOPA and subsequently Pheomelanin are synthesized. If the cysteine concentration in the cell falls below the threshold of 0,13µM (this is taken from this paper), then the switch to eumelanin production occurs. In the case of you second question, there is a different setting. 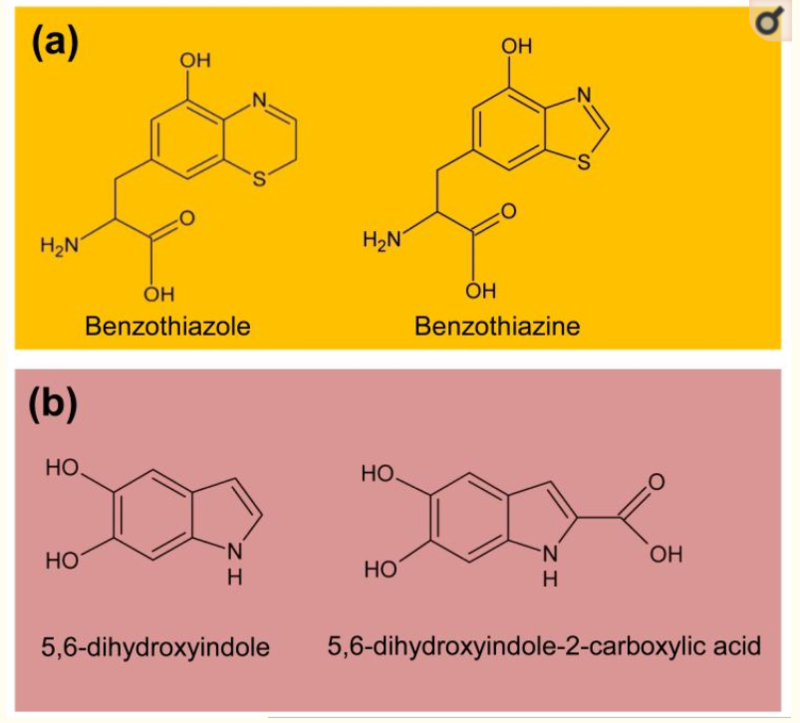 The overall rate of the melanin production (no matter which flavor) depends on the amount of active Tyrosinase (for the production of the first steps in the synthesis cascade). The production of this enzyme is regulated by receptors in the cellular membrane (and different other factors). In fair skinned people (classically red-haired and with freckles) these receptors are not fully functional, resulting much less Tyrosinase enzyme in the cells. This results in fewer available precursors for the melanin production and in turn in less need for cysteine. The reason is that the cysteine pool of the cell is not getting exhausted. As stated above Eumelanin and Pheomelanin are two chemically different compounds. So even if Pheomelanin levels dropped one would not attain Eumelanin through the depletion of sulfhydryl compounds, because they follow completely different pathways of synthesis. This is determined by Genetics, one would have to turn on the SLC24A5 and SLC45A2 genes as a start. α-MSH/MC1R plays a major role in the production of Eumelanin. MC1R Variants "Melanocortin 1 receptor is a highly polymorphic protein, and in humans many of the loss-of-function variants are associated with the “red hair color” (RHC) phenotype. Individuals with a dysfunctional MC1R may have decreased eumelanin synthesis leading to fair skin and an increased sensitivity to UV exposure." MC1R and Pigmentation "There are two major types of pigment present in the skin, the darkly pigmented eumelanin and the red/yellow sulfated pheomelanin. Eumelanin is chemically inert and is highly photoprotective by absorbing UV radiation and oxidants. 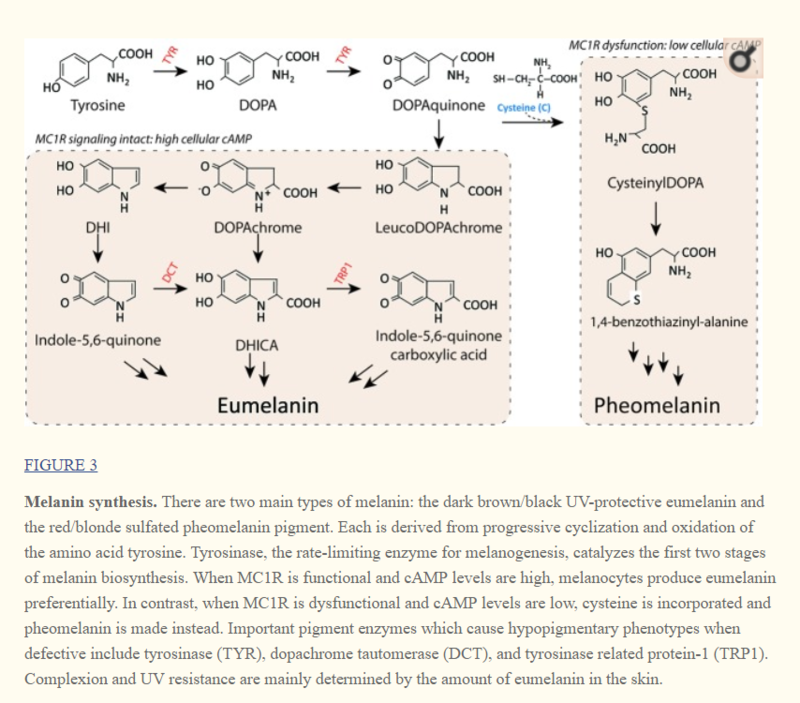 In contrast, pheomelanin is much less efficient at blocking penetration of UV radiation into the skin and can promote UV-induced cellular damage by contributing to free radical and oxidative injury. MC1R signaling is a major determinant for the amount and type of melanin pigments synthesized by melanocytes, regulating both basal pigmentation and the UV induced tanning response. **MC1R signaling increases **eumelanin synthesis****, the ratio of eumelanin-to-pheomelanin, and enhances melanosome transfer to enhance melanin deposition in keratinocytes. Not the answer you're looking for? Browse other questions tagged biochemistry molecular-biology nutrition human-physiology or ask your own question. How does an excessive amount of beta carotene affect skin colour?